The Caudalíe Beauty Elixir has been a staple in our beauty routine for years. It is the first of any facial spray we have every tried and has consistently been the best. The scent is divine with hints of citrus, peppermint, and rosemary; the combination of which is calming and therapeutic. When spritzed on the skin, the mist hydrates and produces a lasting cooling sensation, which has never been replicated in any other facial mist we have ever tried. 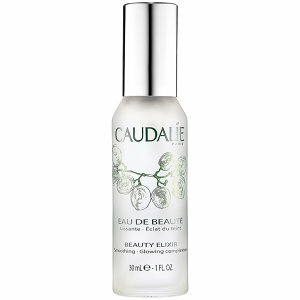 We love to use the Caudalíe Beauty Elixir on cleansed skin as a toner before applying moisturizer. However, our favorite way to use this amazing product is to set our make-up with it and proceed to use it as a make-up refresher throughout the day. Every once in a while, one of our friends will spy us taking the mini glass bottle out of our purse and ask to try it, and every single one of them have become Caudalíe Beauty Elixir loyalists at first spritz! Pro tip: on a hot day, mist a bit on the back of your neck for an instantly invigorating cooling effect.